We have three parent babies. 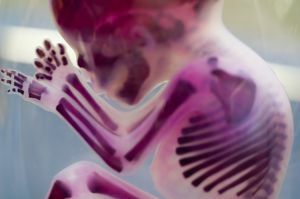 Why can't we grow fetuses outside the body yet? Given the speed at which reproductive technology has advanced over the past few decades, it doesn’t feel all that far-fetched: A future in which anyone can have a baby, regardless of creed or need, whenever they feel like it. Already, in our present moment, one can buy or sell eggs and sperm; we can give embryos genetic tests to ensure the children they produce don’t have any life-threatening hereditary conditions; and babies can even be born, now, with the genetic information from three parents. So it follows that we should soon be able to to have pregnancy outside the body — artificial wombs. Right? You’d think. Scientists have already figured out how to mimic many of the body’s processes for techniques like in-vitro fertilization and even hormonal birth control. But the ways mothers’ bodies support and signal fetuses is incredibly complicated — and the science isn’t yet at a point where we can simulate these processes. And because scientists are prohibited from studying embryos 14 days past their fertilization, that’s one sci-fi vision that is not likely to come to fruition. At least, not in the near future. For now, it’s imagined in The Stork, the second episode of Glimpse, a new original sci-fi series from Futurism Studios (a division of Futurism LLC) and DUST. Watch the episode below. That’s not to say that artificial wombs aren’t useful. They might just have a slightly different use than the sci-fi works that have employed them have envisioned. That is: They can address the growing problem of premature birth. In recent years, doctors have figured out some interventions that make it more likely that babies born in this window will survive. But even then, they’re much more likely to have long-term neurological problems, lung issues, or other effects on their minds and bodies. The survival rate for babies born at 23 weeks is just 30 percent. One more week, though, makes a huge difference; at 24 weeks, the odds of survival double. It’s important now because, in the United States, the rate of premature birth has risen in recent years. No one is quite sure why, but some factors that increase a mother’s risk of preterm birth include the mother’s age (the average age of the first-time mother has risen in the U.S.), and if the mother has other medical conditions during pregnancy (more common for older mothers). Artificial wombs could help. And for this use, at least, they could be on the not-too-distant horizon. In 2017, researchers from The Children’s Hospital of Philadelphia (CHOP) unveiled a working prototype of an artificial womb. In experiments, the system (which looks a bit like a Reynolds oven bag) helped carry eight extremely premature baby lambs to term. The researchers shifted the fetuses into the “womb-like environments” at 110 days gestation — the equivalent of the human border of viability. In their study published last year in Nature Communications, the researchers never refer to their systems as “artificial wombs,” likely because the term carries too much weight and controversy with it. “Our goal is not to extend the current limits of viability, but rather to offer the potential for improved outcomes for those infants who are already being routinely resuscitated and cared for in neonatal intensive care units,” the researchers write. Of course, like plenty (if not all) reproductive technologies before it, the “womb-like environment” was met with controversy. In the days following the CHOP study’s release, a wave of media expressing concerns popped up, with most of them asking some variation of the same questions: How ethical is it to grow a fetus in a bag? Is this the end of natural pregnancy? Will a Matrix-like baby factory open in your neighborhood? And of course, yes: There are absolutely legitimate ethics issues to sort out over artificial wombs. The technology could eventually lower the age at which fetuses are considered “viable,” which could complicate abortion rights. And there’s also the question of who decides which families get access. And this technology won’t move forward until we start having conversations like these — which is exactly why we need to have them now, before the technology gets here. But it also shouldn’t stop the research from moving forward. Yes, parents of premature babies might be uncomfortable seeing their newborn inside a plastic bag (that is, if the CHOP technology matures to be used on humans). But doing so might save the baby’s life. It’s why addressing the binary of whether or not this kind of technology is or isn’t dangerous or “unnatural” is counterproductive. Yes: We’ve got a lot of work to do before artificial wombs are available for human use. We need to increase the breadth and quality of healthcare coverage. We need to revamp the laws and regulations governing reproductive health. But education — about how these devices work, about why they’re needed — and storytelling, about people whose lives could be improved by such devices, can help keep these conversations balanced. It could reduce alarmism and overreaction. It could begin to facilitate the manifestation of this sci-fi fantasy into a real-life story. After all, artificial wombs aren’t so different than any other transformative technology that’s taken root across history. As with those, scientists will create the tools — and we won’t just determine how we’ll use them, but not before we decide how long it is before we stop fearing them, and start exploring the possibilities of a world that uses them. Advanced Reproductive Technology is Here. But Who Decides Who Gets Access?